A cyclic quadrilateral is a quadrilateral inscribed in a circle. A polygon that is inscribed in a circle is a polygon whose vertices are on the circle. Some of the inscribed polygons are shown in the next figure. Examples of polygons inscribed in a circle. 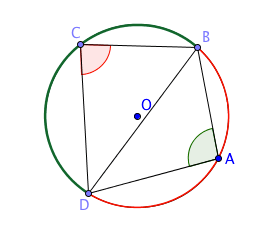 In the figure below, is a cyclic quadrilateral inscribed in a circle with center . Now, is an inscribed angle that intercepts arc . The measure of is half the measure of its intercepted arc (follows from the Inscribed Angle Theorem). This is also the same with . Its measure is half the measure arc . If we add the measure of arc and arc , they add up to a whole circle whose angle measure is . It follows that if we add up the measures of angles and , the sum is also half the measure of which is . Now, it means that the sum of the measures of and is also . Therefore, the measure of the opposite angles of a cyclic quadrilateral is .